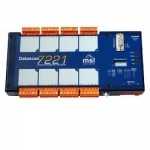 Datascan 7000 series offers a reliable, accurate and cost effective means of connecting plant sensors to standard computers to perform real time monitoring and data acquisition. Datascan 7000 can be used in small standalone systems as well as large distributed networks of up to 1000 channels spanning a distance of up to 1.2 Km. Systems can be configured using what are called measurement processors together with input/output scanners which offer channel expansion. The measurement processor is the heart of the system as it provides the ADC, processing and communication facilties of the system. Measurement processors can be supplied with onboard scanner units e.g. 7320 or with or without channel expansion. Measurement processors can be expanded to 256 inputs locally. If more channels are required, the system can be expanded to up to 1000 channels using the built in network expansion. The system can support a wide range of sensors such as thermocouples, strain gauges, RTD's current, 4-20ma sensors as well as DC voltages. Digital I/O is also available. Datascan is supported by a wide range of standard application software. For assistance in configuring or selecting the appropriate modules for your application please contact us. The heart of the Datascan 7000 System ! Provides the processing power and communications. Most units also have integrated I/O channels. A range of Analog I/O expansion modules for the Datascan 7000 Measurement processors (Voltage, Thermocouple, 4-20mA Current, RTD, PT100, Strain, Resistance Input ; Voltage or 4-20mA Current Output). A range of Digital I/O expansion modules for the Datascan 7000 Measurement processors. The Datascan 7000 range includes two network interface units which enable the Datascan I/O units to be sited at a distance from the main control room computer or to be connected to a system running Modbus software. A range of accessories are available to complete the selection of modules for a specific system. These include power supplies, cables and input completion modules. A range of data acquisition, data logging and control software is available to convert this product range into a high performance system. The software is easily expandable from 8 to 10,000 inputs.